Deter birds from roosting on any surface, permanently. These spikes feature unique-to-the-industry center spikes to prevent birds from alighting between prongs. Heavy duty stainless steel prongs plus long-life polycarbonate base is the perfect combination of affordability and effectiveness. 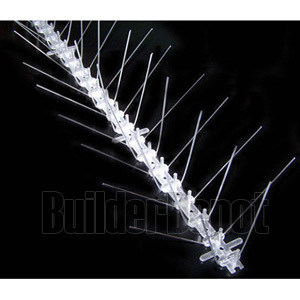 Flexible spikes mount on flat or curved surfaces and are easy to install with adhesive, nails, screws, wire ties, etc. Two-foot sections "snap to the inch" to minimize waste. Outrigger base stabilizers make installation an easy one-person job. Ideal for use on ledges, signs, windowsills, gutters, roof perimeters, air conditioners, chimneys, support structure, awnings, poles, lights, statues, beams, trusses, building projections and anywhere else birds roost. Effective against pigeons, sparrows, starlings, swallows, crows, blackbirds, grackles, many other birds, bats and more. Spikes stand 5" tall and fan out to cover a 8" width. Box contains ten 24" pieces.